As a young child, I quickly fell in love with Tinker Toys. A few years later, I graduated up to Lincoln Logs and then I finally reached the pinnacle of my building days with a plethora of Lego’s that would make any young boy’s mind soar with imagination. In my creative world, there were no instructions. Those were thrown out with the box that they came with along with the plastic baggy which held the tiny pieces – for choking hazards, of course. Those were the days. Now as a responsible adult, however, operating in such a manner in the construction of my own Rice Mill would be absolutely ludicrous. A good rice milling operation starts with an idea, culminates into a plan, progresses into a project, and finalizes into the Taj Mahal of quality rice production that you always wanted it to be. Before you wish upon that star and fuel up the rockets, you have to know how your craft is made and what it is capable of. What IS this vehicle truly capable of? That’s where the plan comes in. 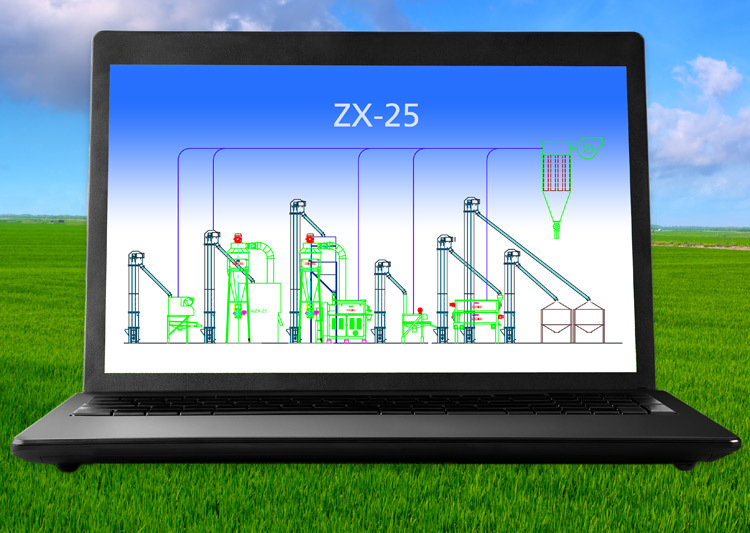 Here are the top 5 reasons for having a rice milling operation CAD drawing and what you can learn from it. 1. There’s too much rice mill at the end of your building. The last and famous words that we’ve heard on several occasions are “Nah, it’ll fit. I’ve got just the warehouse for this rice mill.” While that may be true concerning the important milling equipment like the husker, paddy separator, whitener, length separator, and color sorter, there might be a small step that you’ve forgotten. How are you going to fit the bagging equipment in? And even if you’ve accounted for that, what about how much space is between each machine? Do you have enough room to get forklifts where you need them? Does your staff have enough room to walk freely through the machines so that they can service them appropriately? 2. Is the product going to flow the way you envisioned it? So many times, machines are laid out in sequence without thought of actual flow. Of course you know that pre-cleaner goes before the paddy husker and yes, the white rice water polisher handles the product before the length separator. But what is the angle of the piping that will deliver the product from the previous elevator to that machine? In drawing out your rice mill, you might have to move the milling machines further or closer to the elevator to ensure the correct descent angle into the machine. You might even have to elevate some of the machines to achieve the correct angle or account for higher elevators than you originally thought. 3. How are you going to get electricity to all of these rice machines? If you are going to install your rice mill in an existing building, how are you going to tie your current electricity flow into these new machines? If you are going to install a motor control panel, where is the conduit going to come into it and how will it disperse from there? 4. Who is going to cut the hole in your roof? Without a CAD drawing, you are assuming a lot of details that may or may not be true. One of the worst that we’ve seen is assuming that the height of your building will hold the proper elevators that you need for your rice mill. If you are wrong, there are only two options that you can consider from that point. You can change the entire layout of your mill to achieve a different descent angle that your elevator will work with or you can cut a hole in the top of your building so that the elevator can go through. If you decide to cut a hole, you then have to answer the question of who is going to service the motor to the elevator when it needs it. 5. You are the king, indeed. In a world full of uncertainties, we all need a little encouragement from time to time. As my dad said, “He who not tooteth his own horn is at risk of not having his horn tooteth.” It is perfectly acceptable to step back and high-five yourself for a job well done. The best thing that could happen from laying out a proper CAD drawing in your rice mill operational planning is to understand that you were right all along. Knowing that you meticulously took note of every detail and did your research appropriately will prove true in a CAD drawing. The peace of mind and ability to sleep sound feels good, doesn’t it?